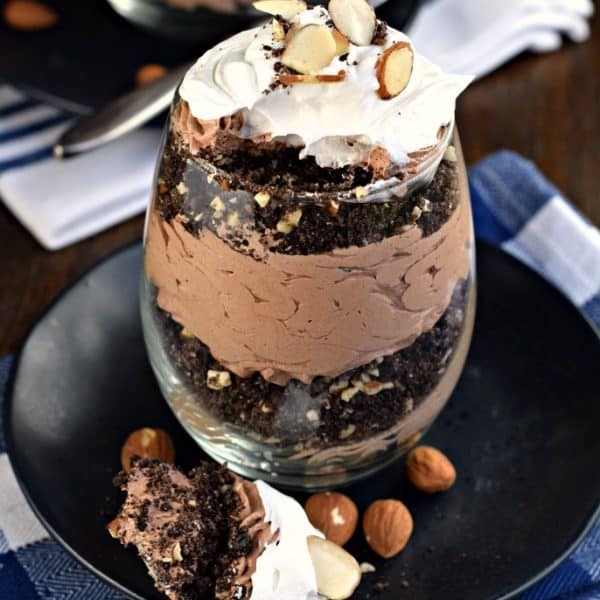 Beautiful layered Chocolate Almond Cheesecake Parfait! Chocolate sandwich cookies with almonds to create a crunchy crust, with a creamy chocolate cheesecake! Perfect for two! Most of the recipes here on Shugary Sweets are “family sized.” Meaning, my family of 6 can enjoy the recipe, sometimes with leftovers. Or my sweets can be frozen for later. Today though? It’s a small batch parfait for TWO. (you could possibly squeeze out 4 mini-parfaits if you want). No significant other? Then may I suggest you layer up a big bowl for ONE and indulge! But seriously, let’s talk about the layers. The crumb layer is a combination of chocolate sandwich cookies and Fisher Nut Almonds. 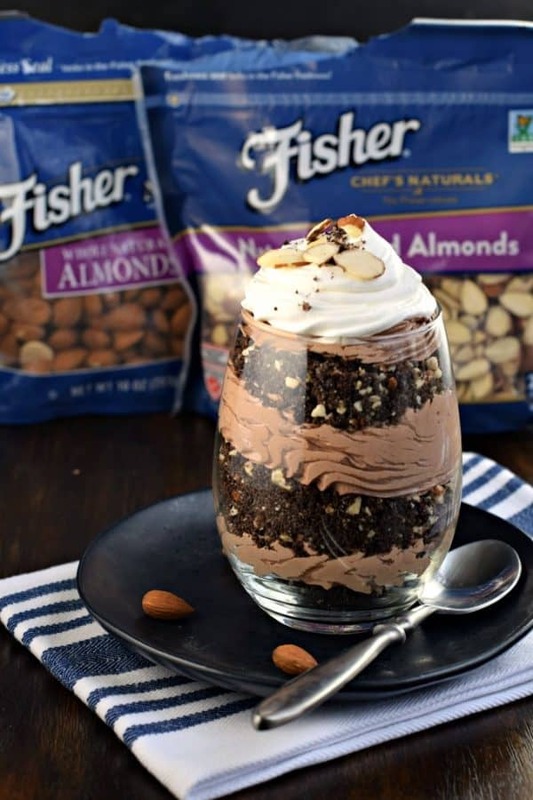 As you know, I’m a big fan of Fisher Nuts and have been using them here on the blog for many years! I love that they are preservative free and non-GMO Project Verified! More than that, I love the flavor. Without even toasting these nuts, they have a deep, nutty taste (that makes sense, right?). I mean, you can go ahead and toast them for a richer taste…but my taste buds love them straight from the bag. Really, they do, because I find myself digging in the Fisher Nut Almonds bag often for a snack! That’s the great thing about the resealable bag, it keeps them fresher longer! But back to today’s recipe! 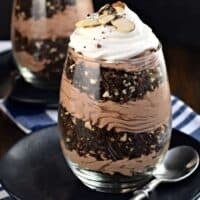 I love adding nuts to my cookies and brownies, so it’s perfect that the crumb layer of this parfait has some almonds mixed into it! 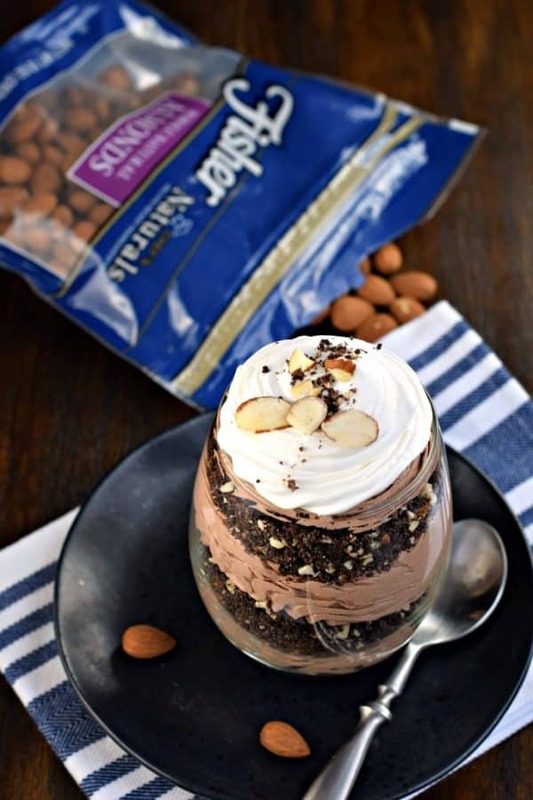 Who will you be making these Chocolate Almond Cheesecake Parfaits for this year? In a food processor, combine the chocolate cookies with the 1/4 cup almonds. Process until crumbs. Set aside. In a mixing bowl, beat cream cheese until fluffy (about 2 minutes). Add in sugar, cocoa and almond extract. Beat an additional 3-5 minutes until fluffy. Fold in whipped topping until blended. In two serving dishes (I used stemless wine glasses), spoon about 1/4 cup of cookie crumbs into the bottom. Dollop some of the cheesecake mixture. Repeat several times for a layered look. Top with whipped topping, sliced almonds, and any extra cookie crumbs! Refrigerate until ready to serve. ENJOY! 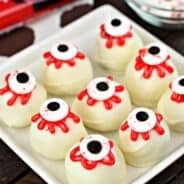 This is the type of dessert I LOVE to make! Looks super fancy, but in truth it’s so easy! Great idea for Valentine’s day dessert, as you said. Pinning! Oh, my goodness! 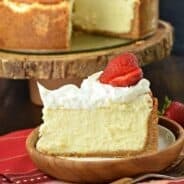 I’m in love with every single layer in this easy dessert! Not sure this would serve two in my house…LOL! are you trying to knock me over and kill me? since this looks to die for. Def making this for Valentine’s Day! 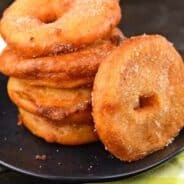 Since the comment section appeared, I have not seen any recipes. I wonder if there is a link between the two. So decadent! Perfect for a date night! Wow boo, I hope Fisher is happy with your creation because it’s pure beauty to my eyes!! I want one of these things stat! 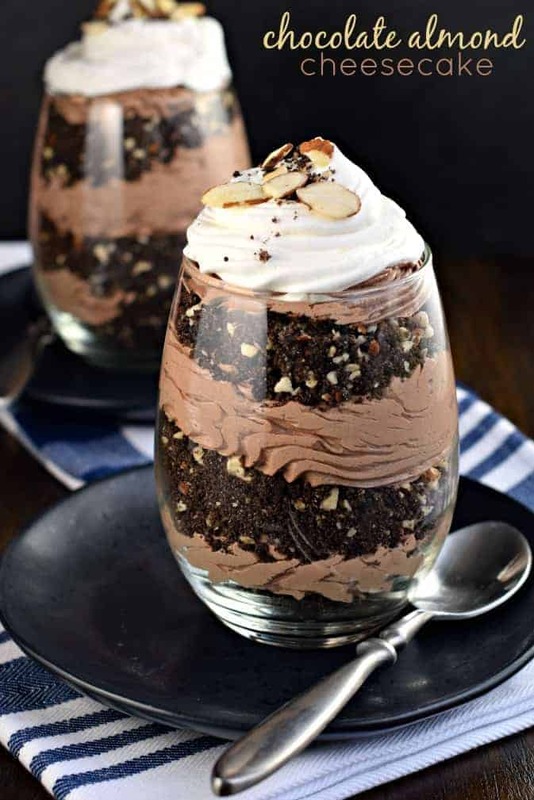 Deserts are not my strong point but this one looks easy. Can`t wait to try it.